Both auditions are for?ALL?roles (there is no?difference between the two auditions). We have decided it will help all those involved if they are split over these two days and it also gives everyone a chance to apply with a choice of ?2 dates. All auditions are planned to take place on stage. 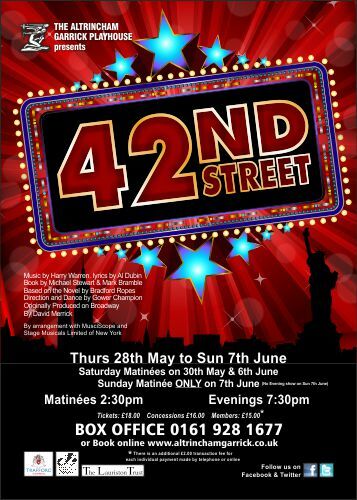 If you would like to register your interest please e-mail?admin@altrinchamgarrick.co.uk?- making sure you put ‘42nd Street Auditions’?in the subject of the e-mail and we will contact you when further news has been announced.